Bobby B initially started of as a collector of music since the age of 7, gradually moving into DJing at the age of 14, playing throughout Scotland in the Roadshow circuit as well as the Asian club scene..
Once he hit 17, he started becoming a regular throughout the Glasgow Urban Nightlife, soon enough taking his talents throughout the UK and DJing at the largest of events from MTV Lick Parties alongside Trevor Nelson, Radio 1 with Tim Westwood to T in the Park and also playing at after parties for the likes of G-Unit, Pharell, Snoop, Busta, a list that can continue…Bobby’s ability to mix a wide variety of genres of music has taken him throughout the world playing at International festivals to private parties all around the globe. 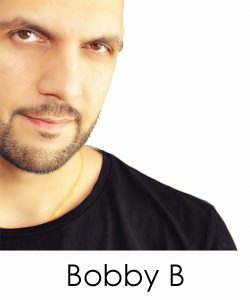 Over the years, Bobby has been seen to be DJing internationally with clubs residing in Dubai, Marbella, Ayia Napa, Ibiz, Delhi, New York and is a regular throughout Europe. Most recently, Bobby has been devoting some of his time in producing music, with his 1st single ‘Teri Tor Vehka’ going straight to no.1 around the world on the day of its release, to the no.1 album titled “11:34” featuring a wide range of Urban & Asian talents. Since the release of the album, Bobby has been involved in many productions with the rest of the collective, releasing chart topping singles as well as a host of mixtapes for BBC Asian Network as well as ‘The Mixtape Kings’ Record Label.